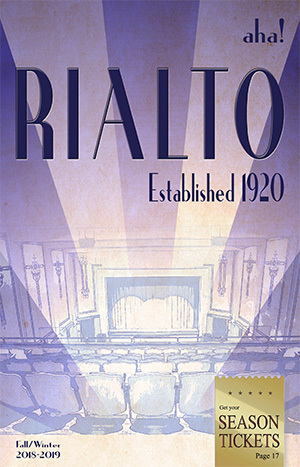 As part of the City of Loveland’s Cultural Services Department, all Rialto Theater Center events and programs are featured in our printed brochure and our email newsletter. The aha! brochure is a full-color detailed calendar of events published three times per year and distributed to thousands of households across Colorado. Our email newsletter is distributed once a month and contains information about upcoming shows and special events. If you would like to receive one or both of these publications, please sign up below. We limit the distribution of the aha! brochure to Colorado and Wyoming, but the PDF is available to view online.